How to Select Forging Materials? Home » News » How to Select Forging Materials? Carbon, microalloyed and alloy steels are low to moderate in cost. The main cost drivers are processing and machining. The alloys are readily hot forged and some shapes are cold forgeable in selected alloys. When precision or closed die forgings are anticipated, the designer should be aware that eventual purchased quantities of forgings should be large enough to justify the typical added tooling preparation charge. There are times when the added tooling costs are well justified to eliminate a difficult to machine shape regardless of purchase quantities. Alloy formulation may also be governed by product dimensions. As section sizes become progressively heavier, higher alloy levels are required to achieve hardenability. Stainless steels are higher in cost than carbon, microalloy and alloy steels. They are hot forgeable into simple shapes and low profile structural shapes, but the high forging pressures restricts net shape forging to simpler shapes. 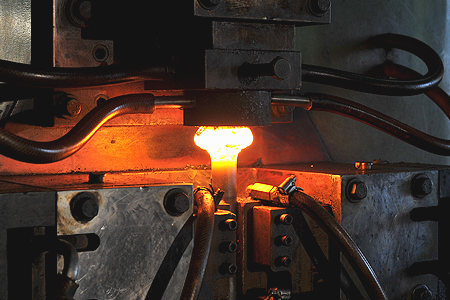 The hot die forging process should be reviewed when more complex shapes are encountered or when the more difficult to forge alloys are specified. The 300 series alloys require 20 to 40% higher forging pressures than the 400 series, due mainly to the higher nickel content. Aluminum alloys are moderate in cost, comparatively low in weight, and readily hot forged because most tool materials maintain adequate properties at the forging temperatures of aluminum alloys. Net shape forgings are being made in sizes up to 400 square inches projected area in the plan view. Net shape forging processes are well developed. Guidelines for design of forgings are available, and are being upgraded. Copper based alloys are chosen when a combination of properties is required, such as corrosion resistance, bearing capability, and moderate cost. Strength is moderate compared with other forging alloys, but generally superior to castings made from equivalent alloys. The alloys can be forged to close tolerances, and smooth surfaces can be maintained. Freedom from porosity, which is found in castings, aids in developing a cosmetic finish. Heat resistant alloys of iron, nickel and cobalt are among the highest cost forging alloys, and often the most difficult to forge. They are generally selected only when the required elevated temperature properties cannot be achieved by other alloy systems. When the most heat resistant alloys cannot be forged by conventional processes, superplastic forging may be a process in which the alloy is forged at temperatures very near the melting range. In the case of "super-super" alloys, such as IN100, MERL 76 and Rene 95, the isothermal process under vacuum is the primary way of forging high quality parts. Titanium alloys are selected for applications requiring high strength, low weight, high operating temperature or high corrosion resistance. Specific strength is high compared with steel. Densities are approximately 55% those of steel and 60% greater than aluminum alloys. The properties and cost of titanium alloys make them the choice in applications where a premium can be justified for high performance, such as aerospace, chemical processing and prosthetic devices. Magnesium alloys are sometimes considered as alternatives to aluminum alloys, and are used when minimum product weight is essential. They offer a weight advantage of about 30% versus aluminum. However, the magnesium alloys are more prone to corrosion than aluminum alloys and require more attention to coatings. Mechanical properties, such as modulus of elasticity and tensile and yield strengths, are not as high as for aluminum alloys, particularly at elevated temperatures. Thus, the strength to weight ratio is not as favorable. Magnesium is the one metal system that seems to have been replaced by reinforced plastics. Contact CFS Drop Forging if you are still puzzled at the selection of forging materials for your design.